Ebonyi State Government has signed a Memorandum of Understanding (MoU) with Union Dicon Salt Plc for large scale production and processing of cassava in the state. The state government said that move to engage in cassava cultivation and processing in commercial quantity is another bold initiative by the Governor David Umahi-led government to mechanize the agricultural sector and propel the much needed economic diversification in the state. In the terms of agreement, Ebonyi State Government will contribute 15,000 hectares of land spread across the state for the Union Dicon Salt to grow cassava and establish a factory where cassava products would be processed into raw materials for export and domestic use. Governor Umahi, who was represented at the ceremony by Prof. Odoh, expressed optimism that the partnership would open up a new vista of opportunities for investments in the state, create jobs and bring about economic prosperity for the people. The governor explained that the volume of raw materials from cassava from the factory would create a large market for the products and support brewery companies in brewing. Umahi encouraged the company to hasten action and complete documentation with the state to enable it start off the agricultural project. The Commissioner for Justice, Nwankwegu who gave an insight into the terms of the agreement, said that apart from the 15,000 hectares of land to be provided, no financial commitment was required from the state government for the agro business. He said that owners of the land would be entitled to five per cent benefit from the project yield and the state government, 10 per cent even as he expressed happiness that the agro investment was coming at a time when the state was in the process of revolutionalizing the agricultural sector as an alternative to solving its economic problem. The Managing Director of Dicon Salt PLC, Chuka Mordi, said his company was willing to invest in the state to take subsistence agriculture to industrial level. According to him, Union Dicon would engage in growing of cassava in commercial quantity and process them into various products like sweeteners and industrial starch for export. He stated that his company’s target was to contribute to the industrialisation of the state and reduce the importation of industrial starch and other products . 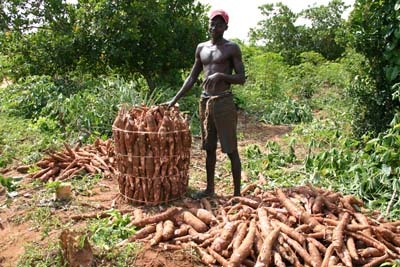 Mordi noted that in spite of the fact that Nigeria is one of the world’s largest producers of cassava, it still imports over 200,000 tons of industrial starch and sweeteners yearly . The agricultural project is expected to commence within the next quarter of this year.